Cangshan is a brand of knives from China. The history of the brand is important because it demonstrates the quality of the knives. Henry Liu founded the company, formerly a kitchenware brand, and traveled the world to find a blade smith that could produce the quality he demanded of his brand. He tested knives from over 80 manufacturers, but they all offered generic quality – the kind that most knives offer. Henry eventually found his blade smith in Yangijang, China, an area known for its cutlery. The finding led to years of research and development that would go on to be the foundation of the Cangshan Cutlery Company. This is the same dedication that the company puts into every piece of cutlery they produce today. The ultimate set of knives. 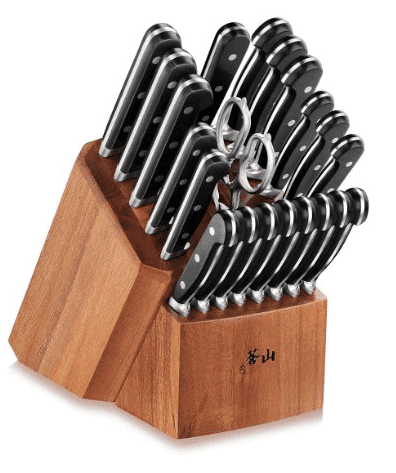 The 59649 is a 22-piece knife set that is made of X50Cr15MoV German steel. Extremely durable, these knives rank a 58 (+/-2) on the Rockwell Hardness Scale. What this means is that they’re very durable with a low chance of breakage or chipping. And you’ll also receive 8, 5″ steak knives. A diamond coated sharpening steel (8 inches in length) is included along with an Acacia wood knife block. The steak knives included in the set. You’ll also find kitchen shears included to help cut through packaging or certain meats with ease. When it comes to balance, these knives really excel. The manufacturer imports all of the German steel into their plant so that they can oversee the assembly of all of their products. Balance is very important to a chef, and these knives have been designed to promote the perfect balance while not being too heavy and causing wrist fatigue. The metal sheers come apart for easy cleaning, and all pieces should be hand washed with care in an effort to avoid damaging any of the blades. Each and every blade has been expertly sharpened, so they’re very sharp right out of the box. Users who want to keep their blades sharp will want to sharpen them every few months. All blades are secured at the handle with a triple rivet design. The block is considered a piece of the 22-set. 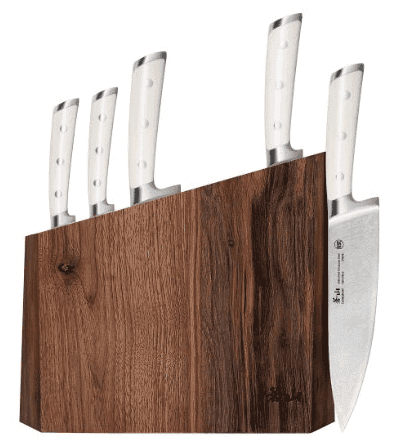 Part of the prestigious S1 series, the 59663 is a 6-piece knife set that offers a very durable handle that I personally like over the previous set. These handles have been ergonomically designed, so they fit perfectly in the user’s hands. Crème colored, the handles hold the unit’s X50Cr15MoV German Steel in place while cutting with three rivets. The santoku included in the set. Handcrafted, the cutting block offers a unique touch with every block offering its own unique wood grain. The block has slots for all of the set’s five knives, and it is narrow, allowing for each blade to have its very own space. 5” Paring Knife – Small and nimble, this knife’s blade comes to a sharp point, allowing it to pierce as well as be used to chop small vegetables, peeling and de-veining as well as smaller jobs. 5” Serrated Blade – A serrated blade is ideal for cutting through meats and thicker foods when a normal blade simply won’t do the job. 7” Santoku Knife – A general knife from Japan, these knives are the right choice for cutting, dicing and chopping. Users will also find that these knives are ideal for mincing, making prep work quick and easy. 8” Bread Knife – The perfect bread knife that allows for quick work of bread. 8” Chef’s Knife – Multi-purpose, a chef knife is designed to be able to do a multitude of jobs. 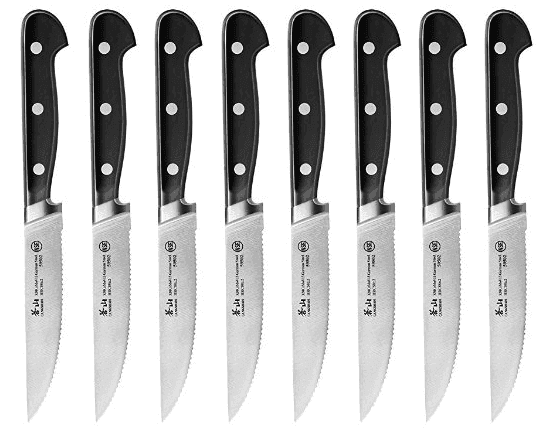 These knives can be used to chop through vegetables, mince, disjoint larger cuts and more. The only minor complaint I found with these knives is that the wooden block can crack. A little oil on the wood every now and then will keep the block in good condition. Otherwise, this is an affordable, durable knife set that is worth every penny. The final set on our list comes from the W Series of knives. 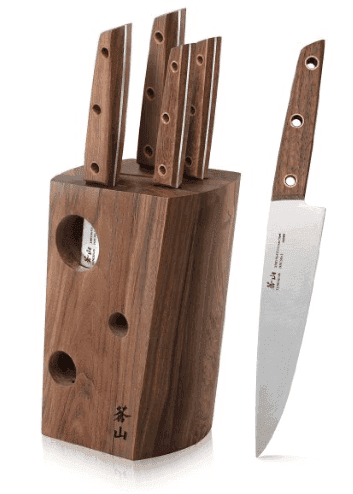 This 6-piece block set includes five knives in total, and the final piece is the wood block. The wooden block is made in a Walnut design that has a unique, dotted pattern on the side, which allows users to quickly and easily see the blades through the side of the block. All of the knives feature a rustic teakwood handle with brass rivets that hold the knife and handle together as one piece. These are knives that will be used on a daily basis for cooking. From meats to vegetable preparation and mincing garlic, these knives are all considered “essentials” in the kitchen by chefs around the world. The bread knife included in the set. Food grade mineral oil should be placed on the knives’ handles to ensure the wood doesn’t dry out. The weight of the knives feel great in the hands while the balance is spot on – all Cangshan knives offer a great balance. Users will find that they need to hand wash all of these knives and dry them immediately when they’re done washing them. The handles and wooden block should be oiled up periodically to avoid any drying that may occur. This is a must-do with all wooden handles that aren’t sealed. Overall, this is a durable and affordable smaller set of knives that is ideal for any chef just starting their knife collection. Cangshan knives are really good. The handle designs have been advanced with the newer series, and this is one of the changes that people have asked for from the company for a long time. In terms of the blades and the holding blocks, they’re all exceptional in my own experience. 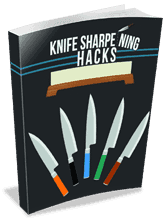 You will need to have a sharpening steel to be able to keep your blades sharp at all times when used often. This is included in the 22-piece set, but the smaller sets don’t have the sharpening steel, which should be something to consider. How do these compare to Wusthoff knives?